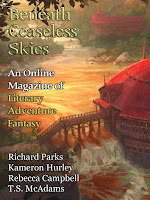 "The Fisherman and the Pig," by Kameron Hurley [bio] (edited by Scott H. Andrews), appeared in Beneath Ceaseless Skies issue 235, published on September 21, 2017. Pro: The setting is fascinating, and Nev is a well-developed, sympathetic character—even if he doesn’t love anyone but Pig. At the end, once Pig recognizes Nev in his new body, his transition from his old life to his new one is complete. Con: It feels like the setup for a more substantial story but it ends just as it seems it should be beginning. All sorts of issues are just dropped: A whole town of people were just poisoned—and about to return to life as zombies? The government is chasing Nev. And what about Branka?